Could be the reason. They've changed a lot in 1.13 and its going to take a while to update the plugin. Make sure you didn't disable the world you want to use Rolecraft in. Sorry 1.8 is no longer supported, you can try an older Rolecraft version which supports 1.8 but the best way to go is to update your server. Im having trouble with getting Mobs to work. They wont show up in the /rc Mobs List and I cant use /msz to spawn them. Hello, when attempting to download the newest version of your plugin, my anti-virus blocked it, saying it contains a trojan virus. My anti-virus has never had a false positive in the past. The trojan is detected on the 3.2.2+ download and newer versions. Anti-Virus programs tend to identify any .jar file as a potential threat. Plugins released on dev.bukkit / Curse are controlled for malware before its possible to download them. I can assure you that there is no malware contained in this plugin (actually you can check yourself the source code is available on GitHub). Did you reload Rolecraft (or the server) after you created the file? What happens if you use the /rc mobs command? Where can we make suggestions? Create a ticket. Delete the template and add the "Enhancement" tag. Thanks. Check the 'experience' entry in the mob's file. It should be something like 10%5-6, if your level is to high you will not get any experience from low level mobs. I'm loving the plugin but I wish that the guards would stop looking at you after a certain block distance. (Maybe an imputed block distance?) And sometimes guards and villagers disappear after I go a long distance away and then show up back up when I disconnect and re-log. They should stop looking at you after some distance. I will check it again. The disappearance is a known issue. If you want to help solving it you can try to measure the distance when they vanish. 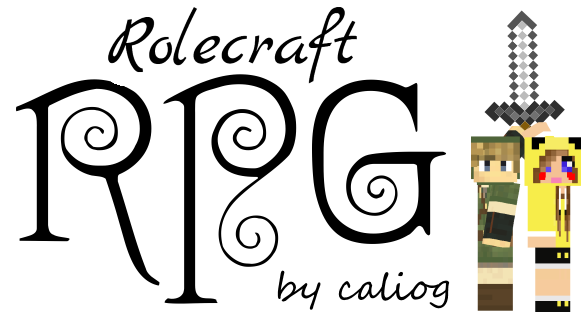 Hey Caliog, i would like to use your plugin in my new server, and maybe do some tutorials once i learned everything (spanish and english tutorials) what do you say? That would be really great, if you need any help, let me know. Is there any way to change the 16 character name restriction for NPC's? I can't find anything about it in the config file. What Texture pack works with the Plugin ? It wold be cool if you could add potion effect to weapons and armor. I'm trying to make a "Beacon Rod" that gives you the glowing effect as long as you're holding it.